Railpictures.ca - Tim Stevens Photo: Brand new CN ES44AC 3822 and CREX ES44AC 1506 lead CN train Q108 over the Uno, MB trestle in the beautiful Assiniboine Valley. | Railpictures.ca – Canadian Railway Photography – photographie ferroviaire Canadienne. 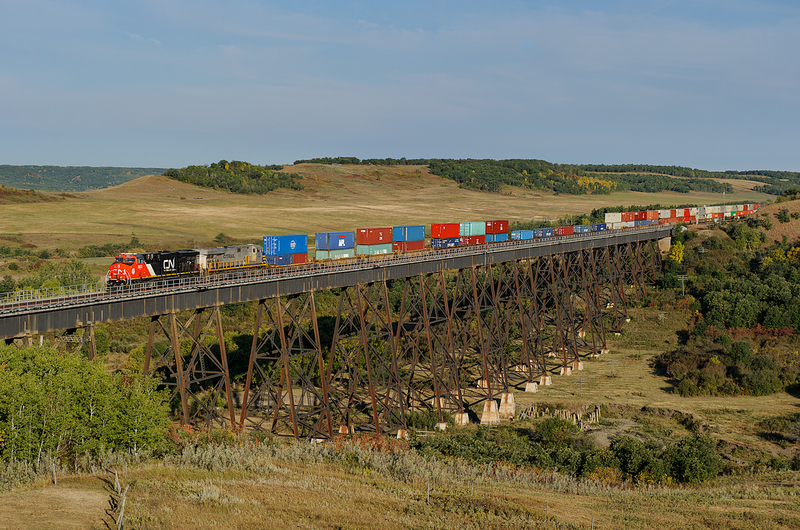 Caption: Brand new CN ES44AC 3822 and CREX ES44AC 1506 lead CN train Q108 over the Uno, MB trestle in the beautiful Assiniboine Valley. Raised within 10 miles of here..The Assiniboine Valley is spectacular with both CN Main and CP north main crossings. Very nice, Tim. Great location.